If you’re looking for free sample job interview questions to practice, you came to the right place. In this article, you’ll find the top 128 common interview questions to practice and know before an interview – including behavioral interview questions and standard interview questions. Reading through and practicing these interview questions will also help you identify areas you need to brush up on, or areas you’re not confident in talking about (so you can work on them before the interview). It’s better to find out now that a topic makes you nervous, rather than waiting for the interview when it’s too late, right? 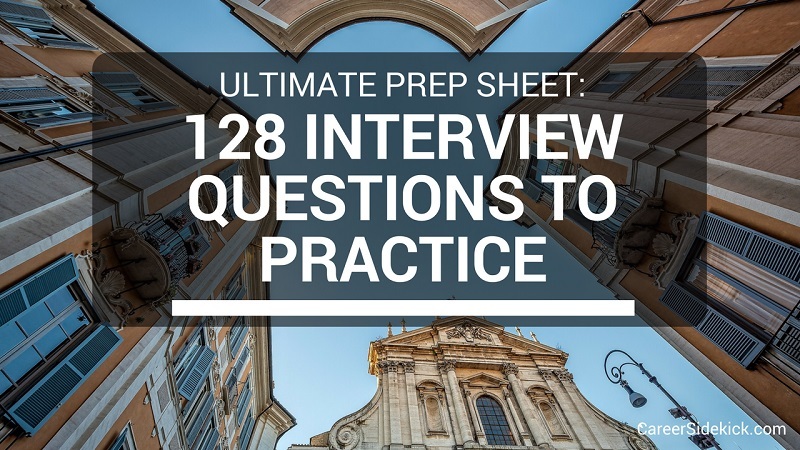 In Part I we’ll cover 75 common interview questions you should practice, broken up into a few different categories. How has your job search gone so far? What other types of jobs have you been applying for? What is one thing you’re looking to either have or to not have in your next position? How soon could you be available to start? Are you willing to relocate/travel? What is it about this opportunity that most excites you? What concerns or hesitations do you have about this opportunity? What is something you think we could do better or differently? What is something you are working on improving right now? If I called your last boss right now and asked them an area you could improve on, what would they say? If I had your three best friends sitting with us now, how would they describe you to me? How would your previous coworkers describe you? How would your current or former boss describe you? What role do you tend to move into in group or team work, and why? What was your favorite job you ever had and why? What would you do in the first 90 days of this position to succeed? What would you do if you made an important business decision and a coworker challenged it? What would you do if management made a decision you didn’t agree with? What do you do when you make a mistake at work? What would you accomplish in the first 30 days on the job? Assume that you come to work here. One year from now you go home one Friday afternoon thinking that accepting this job was the best thing you ever did. What happened during the year for you to feel that way? If you have had a million dollars, what kind of work would you do and why? Give me an example of how you have worked on teams. What role did you play? Describe a time you struggled to build a relationship with someone important. How did you overcome it? Tell me about a time you needed to get information from someone who wasn’t very cooperative. What did you do? Describe a time when you didn’t agree with others. What did you do? Tell me a time when you worked with a colleague who was not completing his or her share of the work. Who, if anyone, did you tell or talk to about it? Did the manager take any steps to correct your colleague? Did you agree or disagree with the manager’s actions? Describe some times when you were not very satisfied or pleased with your performance. What happened and what did you do about it? Describe a time when it was especially important to make a good impression on a client. How did you approach things? Give me an example where you did not meet a client’s expectations. What happened and how did you attempt to fix the situation? When you’re working with a large number of customers, it’s tricky to deliver excellent service to all of them. How do you go about prioritizing your customers’ needs? Describe a time when your team or company was undergoing some changes you had no control over. How did that impact you, and how did you adapt? Tell me about the first job you ever had. What did you do to learn the ropes? Tell me about a time you made a mistake at work, what happened? Describe a crisis you faced at work. What was your role? How did you resolve it? What were the results? Describe a time when you were asked to do something you weren’t trained to do. How did you adapt? Tell me about a time from your work experience when your manager or supervisor was unavailable and a problem arose. How did you handle that situation? Tell me about a time you had to juggle multiple high-priority tasks. How did you handle it? Give me an example of a time when you had to explain something fairly complex to a frustrated client or coworker. How did you make sure they understood you? In a supervisory or group leader role, have you ever had to discipline or counsel an employee or team member? What steps did you take? How did you prepare yourself? Tell me about a time you thought you communicated clearly but were misunderstood. What happened and how did you handle the situation? How Should You Practice Your Interview Answers? Okay, now you know the questions you’re likely to face, but what’s the best way to practice? I recommend you record yourself speaking or practice in front of a mirror. And don’t just memorize a ton of answers word-for-word. It’s going to get all jumbled up in your head and come out wrong in the heat of the moment! And if they ask something slightly different than what you prepared for, you’ll panic.